Where to Find Best Car Camping Tent? Are you looking for the best car camping tent that will guarantee absolute protection to your car against all elements? Then, you should look no more as Lanmodo is the car tent you need to consider going for. It is built with all the things car owners need to enjoy absolute protection on their car without passing through stress. Installation of this wonderful and tech improved car camping does not take much time and is not difficult at all. That is why you should make sure that you consider going for it today. Also, you are going to understand more about the reasons people from different parts of the world are talking so much about Lanmodo car tent both those that have car and those that do not have car when you read to the end of this post. Do you have a large family and you are thinking of outdoor outing with them but do not know the right camping tent that can cover all of you? The Lanmodo car tent is built with enough space for 7 people. It is built with improved technology and standard size that meet the needs of all. 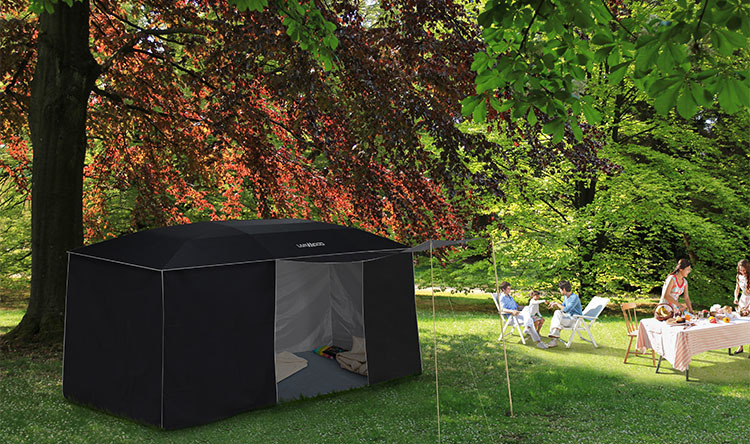 With the standard size it can be enough for you and your family members as well as friends to take cover while in the camping ground. The beauty of Lanmodo car canopy is among the reasons it is now made the best car tent camping for all. In fact, you are not just going to be sure of total cover and protection for your car against the sunlight but also protect your entire family on the camp ground. These and more are the reasons it is now a good option to be used as a camping tent for family that want to travel or planning for happy hour together through outdoor activities. Are you planning for party with your family and want to make it more colorful and exciting? Then you should plan going alongside your Lanmodo best tent for car camping. It is built with all the things you need to make your party time an amazing one with your family. To meet the needs of users for all outing and outdoor activities it is now built with improved technology. It is highly automated to make it easy to use by everyone. With the help of USB port base, you can easily connect your mobile phones and other devices on the car tent. Also, to make your outdoor party exciting and amazingly captivating there is plug in USB lamps included in the design. In that regard, your outdoor party ground is going to be well illuminated with a good party USB lamps attached to the umbrella. You have better chance of enjoying the experience exciting, captivating and absolute protection you need with this tent for car camping made by Lanmodo. There are many more functions of Lanmodo car tent that made it the best family car camping tent you need to go for. It is designed with enhanced features and technology that made it easy to use. With the help of the remote control that comes with it, even a child can easily put it on with a press on a button. The interesting thing about this car tent you need to know is that putting it own with the help of the remote control only takes few seconds. You can also put it off or fold it down the canopy with a press of the button also. In fact, all the needed features to make this car tent the best among others is completely present. It is built to protect the entire car body from front to back. The protection is possible for different kind of vehicles. Your outdoor outing with family to the beach is going to be made remarkable when you make use of Lanmodo camping car tent. It has all the things needed to guarantee you and your family absolute protection. The protection provided by this car tent or umbrella is what made it continue to gain popularity among outdoor lovers. That is why you also should consider getting it while embarking on that outdoor outing to the beach this year.